300 DAYS OF BRIGHT SUNSHINE ! 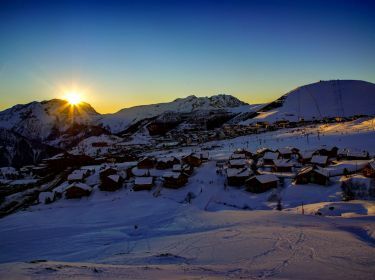 The Alpe d’Huez is situated on a fully south-facing plateau at 1860 m above sea level, and its skiable area enjoys maximum exposure to the sun. So enjoy a day’s skiing in the sun: up to 7 1/2 hours a day of sun in December, up to 11 hours a day in April. The French Weather Bureau has recorded an average of 300 days’ sunshine a year at the resort! Also, on a fine day, you can see 1/5e of France from Pic Blanc. Since 1936, Alpe d'Huez has expanded at an altitude of 1860m on the southern flank of the Grandes Rousses Massif. Also called “The Island in the Sunshine”, this resort enjoys long periods of sunshine (an average of 300 sunny days per year) and a particularly active microclimate. Only 1 hour away from Grenoble and less than 5 hours from Paris, Alpe d’Huez is a great play ground with varied activities to enjoy with your family and friends. This special naming of "Lifestyle Resort" is justified by the resort's natural features and richness. At an altitude of 1450m, overlooking the Sarenne gorge, lies Huez, offering the quaintness of a mountain village just kilometers away from an international mountain resort. The tranquility, comfort and authenticity of this village provides the perfect setting to pass the time. Huez will awaken your sense of exploration, with the discovery of the tiny alleys leading to the Roman church of Saint Anne. One hotel and two country gîtes welcome tourists with genuine hospitality. Shops, bars, a bookstore, and a cyber café are open to the public during the season. Thanks to the "Tele-village" cable car of Huez, skiers can access the resort of Alpe d’Huez within 5 minutes. Alpe d'Huez is the ideal place for lots of activities: sport (hiking, aerial, cycling, horse riding,...), cultural and relaxing, but it's also a resort with big events during the whole winter!